Ahhh, the farmers market. Home of hippie musicians, delightful artisan goods, and all things organic, it is also a prime source for new culinary adventures. Last week at the People’s Food Co-op Market (open Wednesdays year-round! ), I scored the ingredients for some hearty and nourishing Thai curry, a dish easily adapted to the flavors of any season. 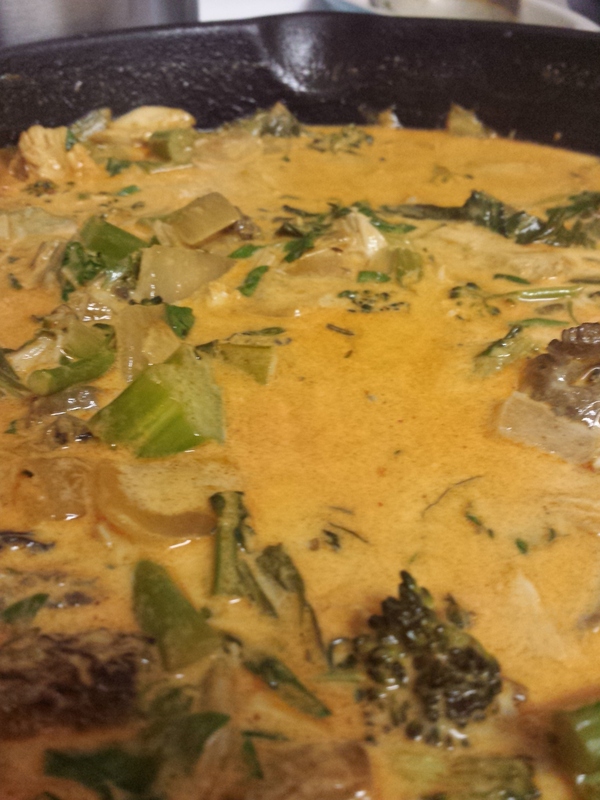 May’s version is a panang curry, because that’s the type of curry paste in my refrigerator; with Asian broccoli, baby bok choy, morel mushrooms, and Thai basil, because that is what the local farmers and foragers are harvesting… and boy, is it tasty. I am especially fond of panang curry because it’s more creamy and rich than its soupy cousin, red curry. I love most things Thai but am strangely particular about curry. If I am eating green curry, it needs to be made with beef. If I’m eating red curry, it needs to have winter squash to create some creaminess. If I’m eating yellow curry, I’ve lost a bet; and if I’m eating panang curry, I’m in heaven. As all curries, this tastes better than it looks. In a large saute pan over medium-high heat, melt the coconut oil. Add the onions and saute them just until that tear-inducing quality loses its edge. Add the mushrooms and cook until they have released their liquid, and the onions are soft. Add the rest of the vegetables and cook them fully, but not mushily. Add the chicken here, if you’re using it. Pour in the broth and coconut cream, and heat the mixture through. Incorporate the fish sauce and the curry paste, then check to see if the creaminess/flavor balance tastes right to you. Add more paste for a stronger flavor, and more cream… well, you get the idea. Stir in the basil, simmer for a couple of minutes to let the flavors meld nicely, then serve it over rice, or next to rice, as is my way. 18 May	This entry was published on May 18, 2015 at 7:39 pm and is filed under Collection. Bookmark the permalink. Follow any comments here with the RSS feed for this post. Uuhhh…Yum! So just out of curiosity, how much are morels in thw PNW these days? They are a hearty $60 a pound here. I was going to use them at a dinner I catered, but couldn’t justify $12 for a small handful! I want to try them sometime and fully meant to go mushroom foraging in CA, but never got to before moving back here. Anway, I love Panang curry…short of having the past, it seems to me to be fairly close to Indonesian or typical Indian flavored curries more than red or green. Do you agree? Or without the paste, what do you use to flavor?